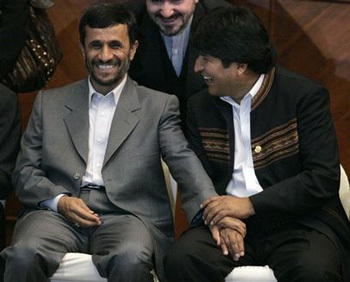 Ahmadinejad and Chavez are united to establish a new world order! The leaders of Iran and Venezuela hailed what they called their strong strategic relationship, saying they are united in efforts to establish a “new world order” that will eliminate Western dominance over global affairs. Since President Barack Obama took office, the U.S. has made repeated overtures to Syria. But Syria has been boosting ties with outspoken critics of Washington, such as Venezuela and Iran. I’m not sure if the second Cuban Crisis will be unavoidable but before it’s too late, the government should have some sort of actions on these threats especially on South America’s Hezbollah which is increasing their presence in the region more than ever before. 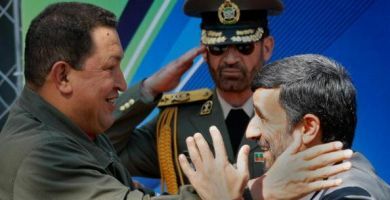 Venezuelan President Hugo Chavez is meeting with Iranian President Mahmoud Ahmadinejad in talks aimed at furthering ties between the two U.S. adversaries. 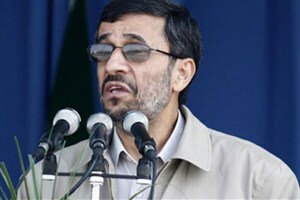 Mr. Ahmadinejad welcomed the Venezuelan leader to the presidential palace Tuesday. Iranian state-run media said the two leaders hope to “boost bilateral cooperation in the oil, gas and petrochemical sectors.” The visit is the latest stop on a 10-day international tour by the Venezuelan leader. 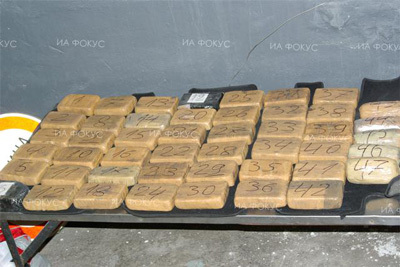 Mr. Chavez already has visited Russia as part of his trip. Russia on Friday agreed to help Venezuela build its first nuclear power plant. Russia recently helped Iran complete construction on Tehran’s first nuclear power plant. There are suspicions of Iran-Venezuela Nuclear joint effort. 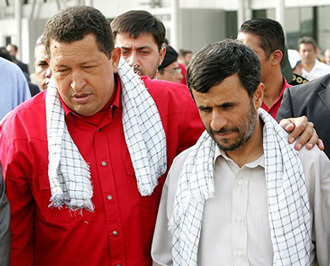 “Venezuela will remain alongside Iran under any circumstances,” Chavez, who is on his ninth visit to the Iran, told President Mahmoud Ahmadinejad during a meeting, according to the presidency website. Relations between Iran and Venezuela, two major oil-producing nations, have flourished under Ahmadinejad’s presidency, especially after Chavez’s openly backed Tehran’s nuclear drive. Venezuelan Minister for Basic Industry and Mining Jose Kahn said Westerners were making efforts to “damage relations between Iran and Venezuela, but they have failed. “Today, the unity between the two countries has resulted in the development of Venezuela with 19,000 jobs created there,” he was quoted as saying on state television’s website. Venezuela’s agreement with Moscow to build a nuclear power plant has raised eyebrows in Washington which has had difficult relations with Chavez.